The University of Perpetual Help System DALTA traces its roots from the desire of Dr. Jose G. Tamayo and wife, Dr. Josefina Laperal Tamayo to answer the call of the government to promote health and educational development in the rural areas when they founded what is now known as the University of Perpetual Help System JONELTA in 1968. Inspired by his parents’ commitment and belief in the betterment of life through national development and transformation, the University of Perpetual Help System DALTA, one of the premier universities in the Philippines was founded by Dr/BGEN Antonio Laperal Tamayo and wife, Daisy Moran Tamayo on February 5, 1975. The school which was first named as Perpetual Help College of Rizal (PHCR) was established along Alabang-Zapote Road, Las Piñas City. It was housed in a four-story building and catered about 700 students in Bachelor of Science in Nursing. From this small beginning, the school began to expand in terms of curricular programs, faculty, research, community service, infrastructure, and professional development. 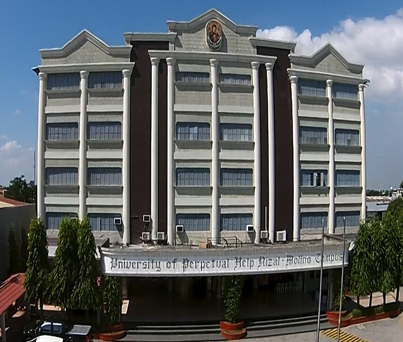 In 1997, the Commission on Higher Education granted the University status to the college, thus, the change of name to the Perpetual Help Medical Center (PHMC). The University established two (2) branches in addition to several agri-businesses. Back in May 1995, the University of Perpetual Help System DALTA – Molino was established and inaugurated with an initial enrolment of 700 students. The following year, the University of Perpetual Help System DALTA – Calamba was established in inaugurated with 360 enrollees. The University of Perpetual Help System DALTA has recently been recognized by Philippine Association of Colleges and Universities Commission on Accreditation (PACUCOA) as the only institution south of Metro Manila to have the most number of Level III Accredited programs. The University of Perpetual Help System DALTA subscribes to the institutional philosophy that national development and transformation is predicated upon the quality of education of its people. It is committed to the ideas of teaching, community service and research, with “Character Building is Nation Building” as its guiding principle. It is continuing in its efforts to achieve its objective of maintaining and sustaining excellence in education. It has instituted an extensive network of national and international linkages in Higher Education and Business. It has established its indelible Perpetualite identity as it steadfastly enshrines its Perpetualite values and aspirations.